How did we end up in a Japanese Prison Camp? When World War II breaks out in Europe and the Nazis occupy their homeland, two Dutch families living in South Africa move to the Netherlands East Indies (now Indonesia) to contribute to the defense of the colony. But two years later, they are caught up in the Pacific War which was unleashed to provide Japan with a secure supply of raw materials. The Japanese occupy Java and commence a policy of ethnic cleansing. The two men are interned leaving the women to fend for themselves. Several months later the women are also forced out of their homes and the story follows them as well as a child and a grandmother through almost four years of increasingly hellish internment in Bandoeng and Batavia. The young women have no idea of the fate of their husbands. Both families survive and return to South Africa as refugees. The Japanese Prison Camp experience on Java gives them forebodings about developments in that country. They leave in 1951. 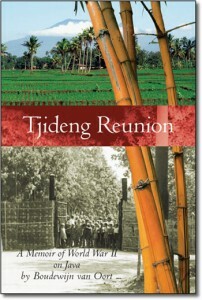 Tjideng Reunion: A Memoir of WWII on Java is told against the backdrop of the dramatic political and military events that unfolded around the two families and changed the course of their lives. Maps and illustrations are included. Boudewyn van Oort was born in South Africa, and after the war was educated in South Africa and Canada (Carleton University, Geology). 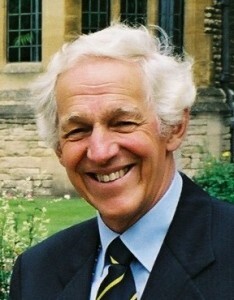 A Rhodes Scholar, he studied Politics, Philosophy and Economics at Oxford, subsequently pursuing an engineering career in the oil and gas industry. Now retired, he lives in Victoria with his wife and daughter. Without extensive research to describe the social and political environment in which this family tale unfolded, the tale would have made no sense. The author was assisted in this task, not only by friends who shared these experiences, but also by historians and archivists in South Africa, Australia, the Netherlands and England. Japanese war diaries were consulted and translated. 28 Responses to "Tjideng Reunion: A Memoir of World War II on Java"
Prachtige site! Ik ben (al jaren) op zoek naar Johanna Maria Adriana BEUMER, (*9-3-1873) de v.t. en b. gescheiden echtgenote van mijn grootvader Jan Willem Scholten (*13-3-1858). Februari 1937 vertrok zij van Amsterdam naar Batavia en haar verdere levensloop is onbekend. Bij naspeuring is komen vast te staan dat zij in het Tjideng-kamp op 2 maart 1945 is omgekomen en bijgezet op het ereveld Kalibanteng te Semarang. Haar broer, Johannes BEUMER, (*1875) woonde sinds 1911 in Medan N.O. Haar zuster, Alida Beumer (*1871) trouwde met Jean Guillaume laCroix en zij zijn in1904 vertrokken naar Medan N.O. Laatstgenoemde was klerk bij de H.J.S.M. Is iets over deze familie BEUMER bij u bekend? I just left a comment elsewhere on your website, but have to add this: The author of “The Flamboya Tree”, Claartje Olink, is a cousin of my husband. Their mothers were sisters. I have no idea why she never mentions the sister and her children in her book. They were all in Tjideng at the end. I will certainly buy your book shortly. Marguerite Ruys mentioned your name, but I did not know who you are. I am amazed at the details and especially the photos! I lived Laan Trivelli 95. We were in Tjideng from1943 till the end of 1944 when jews were transported to Tangerang and later to ADEK. I just published a book about it: “Camp Stories” for English speaking children. Visit our site http://www.gastdocenten.com to read one of my stories. Just looking (searching) for info about my family during their Japanese camp period. I know my grandmother Constanze(Connie) Bosscha was in Tjideng. My father and Grandmother may have been interned in Tjideng. My father is George Berenschot born in Java 1941 and my grandmother was Teresia A. Berenschot. I would love some info on their years in Indonesia. My mother, Wilhelmina Tortike, and grandmother were interned at Tjihapit, Adek and Tjideng during WWII. I only learned the names of the camps while reading her WUV records. I have a identification card written in Japanese that has my grandmother’s picture on it. Mom and her brother left Amsterdam on the M.V. Johan de Witt on 12 May 1940 to join their parents in the Dutch East Indies. I didn’t learn she was a POW until I was in my late teens. She would never speak or elaborate on the events, and it has always been a blank in her life that I have known nothing about. I do have a book on the voyage on the Johan de Witt, but I cannot read it as it is written in Dutch. Wilhelmina died on December 8, 2011, and I had accepted that I would never know anything about this period in her life. Your book will change this and give me clues to this dark period. Thanks for writing of your experiences to enlighten the children of survivors. I am afraid that we are the children of – The Forgotten Holocaust – nobody knows much of our war. Most Dutch people and especially the Jews do not want to know about our Holocaust. I am afraid I have not read your book yet but I will !! You probably have not read Inez Hollander’s publication – Silenced Voice – which describes life in Camp Malang and the notorious prison – Banjoebiroe – which were the camps we tried to survive in !! My whole family have suffered from it all and still the Japanese have never even said – sorry !! Looking for Jan Frederick van Joolen. I have ordered your book Tjideng reunion via Amazon. I am an old Indischman born 1941 in Batavia, in Indonesian language anak Betawi. I don’t agree with your answer to Gerard, writing about the suffering of those who survived the camp life. You write by the end of 1945 the sufferings were gone. Oh oh have you never heard of the bersiap period from the end of 1945 till mid 1947, wherein some 3400 to an estimated 20000 people, mostly women and children were raped and murdered by young Indonesians called pemuda’s. 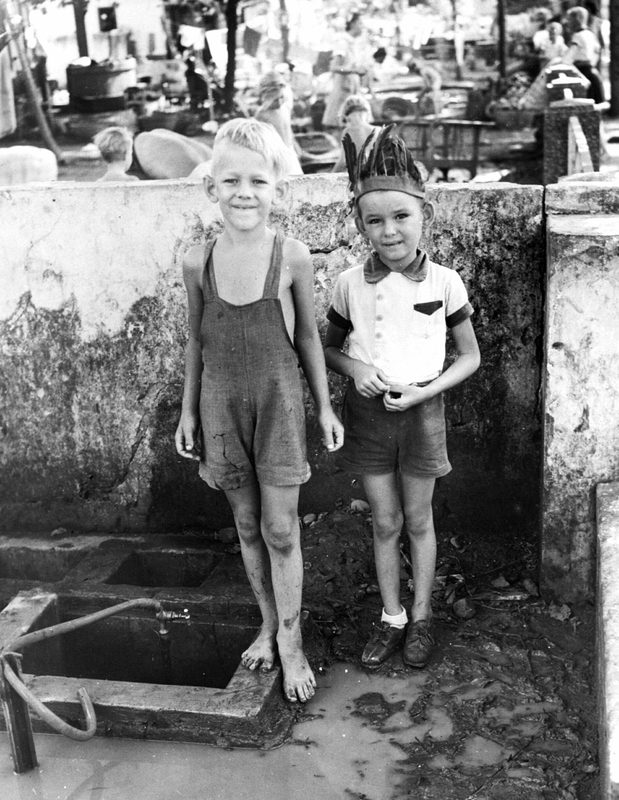 Early 1946 Dutch troops were detained by the British in Malacca, causing indirectly a lot of victims in Indonesia. I really liked your book. My mother with 5 children survived three years in Tjideng camp. My father was in another camp but never found out which one. He had been in a prison before he went to a concentration camp. The suffering in Indonesia had ended but started again when we went to Holland. The war left many wounds that never healed completely. My father suffered from severe astma and could not work again. It’s no fun, to lose twice everything ,needing the help of friends and family to be able to live! Just wonder how my mother could keep us alive. She was a very courageous woman and did things Sonei did not approve of. I am still looking for more photos of Tjideng camp. I always find the same ones. Do you know who could help me? My eldest son wants me to write my life story ,so they won’t forget. I just don’t know how! Far too much has happened. I was in Tjihapit with my mother from 1943 – 1944, then went on “transport” but luckily not to Tjideng but Kramat, where we stayed until 1945, our liberation. Kramat is near Batavia. I would like to trace my aunt and uncle Frank and Emma Erdbrink who were in Java before the war running a tea estate for the Dutch East India Co. And we’re interned by the Japs. I wonder if anyone can be of any help. I am going to Indonesia in October to visit family. Can I get your book in the Netherlands too? It will be very expensive to ship from Canada to Holland. By reading books about the war in Indonesia I learn more about my grandparents and what happened to them. They never spoke about this period in their lives. I feel a lot of sadness reading the stories but it explains so much, why they acted the way they did. I still miss them every day. I have recently been searching out facts about our life in Japanese prison camps to add to the meager stories my mother told us about our life in those years. My family also left South Africa to contribute to the defense of Dutch East India and indirectly the Netherlands. My father was in the fleet that escaped from Soerabaya and was on the Tawali one of 2 ships out of 16 that escaped destruction and sinking. My mother and sister and I were in Bandoeng and then moved to Ambarawa and then to Banjoe Biroe. My father was reunited with his family in November 1945 and in February 1947 we eventually arrived back in South Africa. Mijn naam is Ruud Siefken. Mijn vader was Edwin Siefken Wito, zijn moeder, Marie Siefken Stummer heeft ook op Java gewoond, ook in kampen gezeten en later met kinderen naar Nederland gekomen. Mijn vader hadden 1 zuster Laura, broer Benno, en broer Roland. Wie kent deze Namen. ? Hello Peter, I am a bit late in replying to your comment, and for that I apologize. I know full well about the bersiap, which had more or less started shortly before we left Indonesia in October 1945. The book, Tjideng Reunion, I published, and which is the raison d’etre for this website is a memoir and not a history of Java. We were fortunate to escape the worst of the bersiap. I was 13 when I entered Grogol. Also shipped to Tjideng, Kramat, Grogol again and Makassar. Love to get in contact with Jan Arend and Riebert Volten, children of Dr. Jo Volten. She took care of me all the way through WWll. Thanks forever. My name was Marjolyn von Pritzelwitz van der Horst. I am the daughter of Riebert Volten. My mother died in 2012. My mother mentioned you several times. I would love to get into contact, because it is largely unknown to me what happened to my mother during the war. Maybe Boudwyn van Oort can send you my emailadress? How interesting to find this site. My parents, Diderik Hendrik (Henk) and Alida (Ali or nickname Dun) van Dongen also left from South Africa in 1940/1 to go to Indonesia to serve in the Dutch Forces there. I think they lived in Bandoeng from where my father was sent to the Thai railway project and my mother interned on Java. My mother was in the ‘kook-ploeg’ with two others and they were known as Dun, Tak en Kas – so if anyone knows these names I would love to hear from you. She would have been around 30 years of age – just too old to be picked as a ‘comfort woman’, she said. I have found my father’s internment document but can find nothing on my mother. Any leads would be most welcome. Thank you. Hi Leo, I see you spent time in Grogol. I have the memoir of Elly Campioni on my computer. It is an interesting read, mostly about Grogol from the perspective of a camp leader. It is in Dutch. I would be happy to share it with you. I also have a copy of Ada Hartgrink’s story about her voyage home to Amsterdam on the johan de Witt (Feb 1946). That too is a good read, also in Dutch, though I also translated it into English- a huge job- for the daughter of Ada. 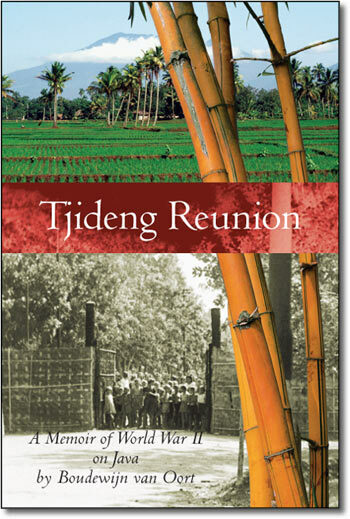 Tjideng Reunion: A Memoir of WWII on Java is told against the backdrop of the dramatic political and military events that unfolded around two families and changed the course of their lives.